For other uses, see Descartes' theorem (disambiguation). In geometry, Descartes' theorem states that for every four kissing, or mutually tangent, circles, the radii of the circles satisfy a certain quadratic equation. By solving this equation, one can construct a fourth circle tangent to three given, mutually tangent circles. The theorem is named after René Descartes, who stated it in 1643. Geometrical problems involving tangent circles have been pondered for millennia. In ancient Greece of the third century BC, Apollonius of Perga devoted an entire book to the topic. René Descartes discussed the problem briefly in 1643, in a letter to Princess Elisabeth of the Palatinate. He came up with essentially the same solution as given in equation (1) below, and thus attached his name to the theorem. Frederick Soddy rediscovered the equation in 1936. The kissing circles in this problem are sometimes known as Soddy circles, perhaps because Soddy chose to publish his version of the theorem in the form of a poem titled The Kiss Precise, which was printed in Nature (June 20, 1936). Soddy also extended the theorem to spheres; Thorold Gosset extended the theorem to arbitrary dimensions. Kissing circles. Given three mutually tangent circles ( black), what radius can a fourth tangent circle have? There are in general two possible answers ( red). Descartes' theorem is most easily stated in terms of the circles' curvatures. The curvature (or bend) of a circle is defined as k = ±1/r, where r is its radius. 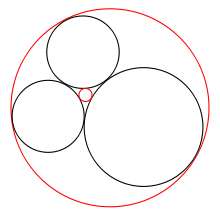 The larger a circle, the smaller is the magnitude of its curvature, and vice versa. The plus sign in k = ±1/r applies to a circle that is externally tangent to the other circles, like the three black circles in the image. For an internally tangent circle like the big red circle, that circumscribes the other circles, the minus sign applies. If a straight line is considered a degenerate circle with zero curvature (and thus infinite radius), Descartes' theorem also applies to a line and two circles that are all three mutually tangent, giving the radius of a third circle tangent to the other two circles and the line. The ± sign reflects the fact that there are in general two solutions. Ignoring the degenerate case of a straight line, one solution is positive and the other is either positive or negative; if negative, it represents a circle that circumscribes the first three (as shown in the diagram above). Problem-specific criteria may favor one solution over the other in any given problem. One of the circles is replaced by a straight line of zero curvature. Descartes' theorem still applies. Here, as all three circles are tangent to each other at the same point, Descartes' theorem does not apply. It is not possible to replace three circles by lines, as it is not possible for three lines and one circle to be mutually tangent. Descartes' theorem does not apply when all four circles are tangent to each other at the same point. parametric solutions of which are well-known. To determine a circle completely, not only its radius (or curvature), but also its center must be known. The relevant equation is expressed most clearly if the coordinates (x, y) are interpreted as a complex number z = x + iy. The equation then looks similar to Descartes' theorem and is therefore called the complex Descartes theorem. Again, in general, there are two solutions for z4, corresponding to the two solutions for k4. Note that the plus/minus sign in the above formula for z does not necessarily correspond to the plus/minus sign in the formula for k.
with the case ki = 0 corresponding to a flat hyperplane, in exact analogy to the 2-dimensional version of the theorem. Although there is no 3-dimensional analogue of the complex numbers, the relationship between the positions of the centers can be re-expressed as a matrix equation, which also generalizes to n dimensions. This page is based on the Wikipedia article Descartes' theorem; it is used under the Creative Commons Attribution-ShareAlike 3.0 Unported License (CC-BY-SA). You may redistribute it, verbatim or modified, providing that you comply with the terms of the CC-BY-SA.